NHT-Enterprise-owned Galen Terrace Apartments in Washington, D.C. showcases how housing can be affordable while also helping to improve the health of the city's Anacostia River. A new stormwater management system at the property will reduce the harmful impact of excessive and polluted runoff entering local waterways. Not only does the environment benefit from the system, so does the property's bottom line. The system will reduce the building's growing water bill by lowering stormwater management fees, and it could even be a source of revenue via D.C.'s novel Stormwater Retention Credit (SRC) trading program. So how does the stormwater system work? With the help of the Anacostia Watershed Society (AWS) and the D.C. Department of Energy & Environment's (DDOE) RiverSmart Communities program, a stormwater planter was constructed that included retention walls and natural infiltration materials such as sand, rocks, and soil. The property's residents even flexed their gardening skills by adding native plants. The new landscaped area will diffuse, absorb and slow down rainwater before it can enter a nearby storm drain and adversely impact the water quality of local streams and rivers. The stormwater management system at Galen Terrace is one of a series of investments we have made to improve the quality of life for residents. Developed by NHT-Enterprise and Somerset Development, Galen Terrace was the first rehabilitated property in D.C. to meet all of the 'green' criteria under the Enterprise Green Communities Initiative. Today, the Anacostia River is too polluted for swimming and fishing, but hopefully with more stormwater renovations like the one at Galen Terrace, city residents will someday soon be able to enjoy all that the river has to offer. The National Housing Trust installed rooftop solar panels on top of Nixon Peabody's Washington, D.C. office as part of the city's first community solar project. The energy credits generated by these solar panels will be donated to the residents of Copeland Manor Coopertave, and NHT-Enterprise-owned affordable housing community in Southwest, D.C.
Special thanks to our partners Nixon Peabody, Amidus Solar Consulting, Brookfield Properties, District of Columbia Department of Energy & Environment, Enterprise Community Partners, Norton Rose Fulbright LLP, Pepco, and Solargaines, for helping bring this project to life. Sustainability is often thought of in the real estate world as a frill, something nice to spend money on if there are extra funds. Fluff. But investing in sustainability measures can significantly improve the financial performance of affordable housing properties by creating very real and meaningful savings on owner-paid utilities. Finding opportunities to retrofit lighting, install low-flow water fixtures, or replace HVAC units with high-efficiency models not only improves the property from a capital needs perspective, but also generates savings. These savings allow properties to spend money where is it truly needed, like on deferred maintenance or resident services, rather than on utilities. NHT-Enterprise has incorporated this way of thinking about sustainability across its portfolio of 17 asset-managed properties. Whether performing a full rehabilitation or a one-off retrofit, NHT-Enterprise has effectively combatted high utility costs while simultaneously increasing the quality of housing and the environment. Copeland Manor Apartments is an affordable housing property located in Washington, D.C.'s Marshall Heights neighborhood developed by NHT-Enterprise. The new rain garden installed at Copeland Manor will reduce stormwater runoff by collecting rainwater on site and soaking it into the ground, where natural processes help remove pollutants. The stormwater management system at Copeland Manor is one of a series of investments that have been made to improve the quality of life for residents. Copeland Manor demonstrates how housing can be affordable and sustainable, while improving the environmental conditions of an urban community. 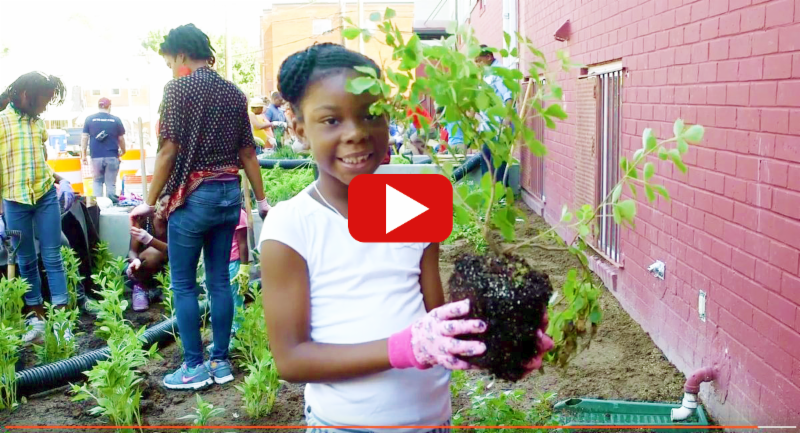 This project was funding through a D.C. Department of Energy and Environment Community Stormwater Solutions Grant and the video was made possible by Energy Efficiency for All. Channel Square Apartments is an NHT-owned affordable housing property located in Washington, D.C. Thanks to funding from the MacArthur and Wells Fargo Foundations, NHT was able to install D.C.'s largest rooftop solar system on privately-owned property. In addition to Channel Square's rooftop solar system, the property also features a hybrid carport/solar panel structure in the parking lot. The solar power generated by these panels will save Channel Square an anticipated $60,000 annually. Video made possible by Pepco Holdings.